Using angled holes or angled pocket holes to attach pieces of furniture together has slowly been gaining in popularity over the years. In the past you could only find it used on fine furniture, where the cosmetics of puttied fastener holes on the surface was unacceptable. But today it’s becoming so commonplace, that you find furniture manufacturers like IKEA using it on a consistent basis. Angled holes are used most commonly to “toe screw” boards together. If you think of toe nailing the bottom of a 2”x 4” stud to the bottom plate of a wall you’re framing, you know what toe nailing is. The only difference between that and toe screwing, is that we’re doing it to screw boards together, rather than nail them. Where you don’t find angled holes used a whole lot is on DIY projects. The main reason for this is the difficulty in drilling angled holes. It is virtually impossible to drill angled holes without a guide block and clamps, with each hole needing to bet set up and clamped, before drilling. This adds a level of complexity that most DIYers don’t want to bother with. However, drilling angled holes isn’t as hard as most people think. 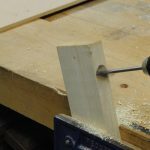 While having a permanent setup and jig for drilling them is nice for drilling a lot of angled holes, you can set up to drill a single hole in a matter of minutes; and all you need is a drilling jig block and some clamps. Generally speaking, it is easier and more accurate to drill angled holes with a drill press, than with a handheld drill. The drill bit is going to try and wander, and this is more easily controlled with a drill bit. But this assumes that you’re going to use a clamp or vice with the drill press, rather than trying to do it freehand. As a general rule of thumb, drilling on a drill press is supposed to be done with the workpiece clamped in a vice, so this shouldn’t be an issue. Nevertheless, you can drill angled holes with electric hand drills as well. The only real precaution I’d make is to go slowly, as you can pull the jig out of position if the drill bit gets caught against the wood and bogs down. That will cause you to drill the hole in the wrong place or create a damaged edge on the hole, potentially causing serious problems for your project. In theory, any drill bit can be used for drilling angled holes. But in practice the best drill bits for this are brad point drill bits. The brad point allows the drill bit to engage the workpiece, centering itself where you want the hole. This helps keep the drill bit from wandering off location when it engages the wood. If you are not using a brad point drill bit for your angled holes, then it is recommended that you drill a small pilot hole, less than half the diameter of the final hole. This pilot hole should be drilled perpendicular to the surface of the workpiece, ensuring that the drill bit doesn’t have a chance to wander. It will help hold the main drill bit for the hole on target when it comes into contact with the wood. The actual angle you drill the hole will depend on the purpose of the hole you are drilling. Obviously, it will be for some sort of fastener; but what type? If you are drilling a pocket hole for use in toe screwing board together, than the most common angle is 15 degrees. Most angled hole jigs and drilling blocks are set for this dimension. However, you can drill angled holes at whatever angle is appropriate for the project you are working on. Fifteen degrees is a shallow enough of an angle to show that if you can drill at 15 degrees, you can drill at pretty much any angle. There are adjustable jigs for drilling angled holes, which will allow you to select your own angle, from about 15 degrees all the way to 90 degrees. The key to drilling any angled hole is the jig. This acts as a guide for the drill bit, ensuring that it stays aligned where you need it, so that the hole comes out where you want it. There are several models of jigs available on the market, but most are preset at 15 degrees and look something like the one on the left. The adjustable ones, which will do multiple angles, look like the one on the right. Notice that both of these jigs have flat surfaces, both to come into contact with the workpiece to be drilled, and to be used for clamping. It is important to note that the one on the right will not hold the drill bit as steadily as the one on the left, so the hole could wander slightly if there isn’t a pilot hole. You can make your own angled hole jig easily enough out some scrap hardwood. To start, you need a block where you are sure the ends are exactly perpendicular to the sides. Drill a hole in the end of this block, keeping the edge of the hole a good ¼” from the edge of the block. Then, cut the block off at a 15 degree angle, or whatever angle you need your holes to be at. Finally, attach small blocks to both sides of it, so that they are flush with the cut edge of your angled hole jig, to act as a clamping surface. The only problem with a jig of this sort is that it will not last as long as a commercial jig. The commercial jig above has a steel bushing for the drill bit to go through. The homemade one does not. However, if you only need to do a limited number of holes, this would work out quite well.